Kariega Game Reserve is an internationally renowned malaria-free “Big-5” private game reserve set in 10,000 hectares of pristine African wilderness incorporating the picturesque Kariega and Bushman’s Rivers, just 10 minutes from Kenton-on-sea and 80 minutes from Port Elizabeth. Situated in the heart of 1820 Settler Country, the reserve is a natural extension to Cape Town and the famous Garden Route. Kariega offers a combination of “Big-5” and general game viewing and an expansive variety of fauna, flora and birdlife in a landscape that spans across 5 different eco systems offering the most dramatic views and vistas. The result is very powerful and truly unique to Kariega. In addition to unforgettable game viewing from open vehicles with qualified game rangers, the Kariega experience is unique in its offering of a diversity of activities which include guided bush walks, river cruises, canoeing, fishing, an overnight bush camp activity, a spa and gym and visits to the nearby golden beaches of Kenton-on-Sea. 10 spacious, luxuriously appointed, en-suite thatched suites. All air-conditioned with an overhead fan. Guests can relax, viewing game and enjoying the stunning vistas from their private patio. A luxury lodge which accommodates 20 guests in 10 superbly appointed suites, each with own plunge pool, with panoramic views from private viewing decks. The Lodge boasts unique African-style lounges, dining area and boma with an outdoor pool. Here guests can unwind in front of warm log fires, enjoy sumptuous cuisine or simply share experiences of the African bush. Children over 10 years are welcome. Kariega Main Lodge offers families, friends and couples a relaxed and friendly environment to enjoy the African bush. All the log chalets are air conditioned, with en-suite bedrooms, and large private viewing decks. Each has a spacious lounge and living area which is great for socializing before retreating to the privacy and comfort of your bedroom. 21 Log chalets, with large private viewing decks (some with private pools) offering privacy and stunning views of the Kariega River valley. All the log chalets are air-conditioned, with en-suite bedrooms, fire place and satellite TV’s. Set in a remote part of the reserve with spectacular views, The Homestead is a private lodge and perfect for a group or family of up to 14 persons, wishing to enjoy a unique safari experience tailored to their own needs. Children of all ages are welcome. The Homestead is a private lodge which offers its guests all the comfort, convenience and luxury of their own home. With a dedicated game ranger and chef, guests have the flexibility to plan their day according to their own specific needs. The Homestead is set in a remote and private part of the reserve. With five spacious bedrooms, all en suite, a bar, swimming pool, satellite TV, playroom for children and spectacular views, it is the perfect lodge for the sole use of a group or family of up to 14 persons. Morning and evening game drives with experienced rangers give guests the opportunity of game viewing from open vehicles. Guests can expect to be enthralled with the sightings of lion, elephant, rhino, buffalo, leopard, hippo, hyena, giraffe, zebra, eland, kudu, wildebeest, waterbuck and a variety of antelope, as well as a myriad of bird species, including nesting fish, martial and crowned eagles. At least one game drive will include a boat cruise on the stunning Kariega or Bushmans rivers. During one of your morning game drives, you will enjoy a majestic cruise down the Kariega River on the “Kariega Queen”. An abundance of bird and animal life makes for exciting game viewing whilst enjoying the peace and tranquility of this dramatic river valley. Our optional daily boat cruises ferry our guests down the Bushman’s River, through the quaint village of Kenton-on-sea to its picturesque and user friendly beaches. Kariega offers a variety of well marked hiking trails on the predator-free, eastern River Lodge section of the reserve. 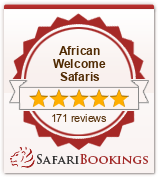 This provides our guests with the opportunity of walking safely amongst more than 25 species of game and birdlife. Our more energetic guests can enjoy the freedom of game viewing whilst riding through the African bushveld. Mountain Bikes are readily available and trails are clearly marked. Take one the canoes for a leisurely paddle down either the Kariega or the Bushman’s rivers and watch in blissful silence as the river birds and animals go about their daily business. Guests are welcome to bring their own fishing equipment for fishing in the magnificent Kariega River. River Lodge is perfectly equipped and situated for the keen fisherman. Rods are ready and waiting for guests to fish either from the River Bank, a canoe or a boat. Take your pick! For the enthusiastic golfer the Royal Port Alfred and (Gary Player designed) Fish River Sun Golf Courses are, respectively, 25 and 40 minutes away. The golden beaches of Kenton-on-sea are less than 15 minutes away. If you plan your trip well, you can be thrilled by combining big-5 game viewing, river fun and beach beauty!